Right off of South Street next to the famous Cerritos Auto Square and across the street from the Cerritos Mall. If you're looking for a place to enjoy amazing food and great beer, come to BJ's Restaurant & Brewhouse, a California staple that's grown only more popular throughout the years--and with good reason! We're a proud part of the California tradition of top notch food and beer. BJ's Restaurant & Brewhouse is dedicated to bringing you an amazing selection of beer. Our brewers work hard to handcraft a selection of delicious beers that are consistently spectacular. Many of our beers go on to win awards in beer competitions throughout the nation. And no matter what your tastes are, you'll find something that you love, from our fresh and lively Brewhouse Blonde to our dark and powerful Tatonka Stout. We even have a beer specially crafted for fans of mass-produced American light beers; our flavorful alternative is called LightSwitch Lager. Come by and try whatever beer suits your fancy from our variety of regular and seasonal ales and lagers, and prepare to be amazed! Great beer calls for great food, and BJ's Restaurant & Brewhouse has worked to create an extensive menu filled with a variety of different options, from our Housemade Soups and Salads to our Handcrafted Burgers. But we're probably best known for our BJ's Signature Deep Dish Pizza, a delicious meal that we've been serving for years. Choose from great options like Gourmet Five Meat pizza, BJ's Classic Combo pizza, and Sweet Pig pizza. Just be sure that you don't get too full for dessert, or you might miss out on our famous Pizookie! 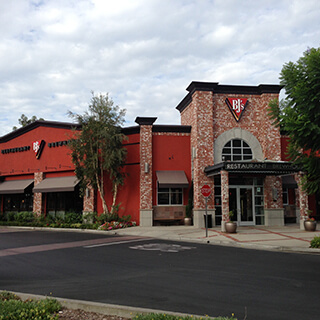 There are lots of places to eat in Cerritos, but if you're looking for a versatile experience, where you can eat with a large group of friends or just sit back and have a few beers while you watch a game, you can't beat BJ's Restaurant & Brewhouse! The local favorite in Cerritos. Fun, energetic atmosphere! Great for watching the game or a casual night out! Cerritos always has a great selection of local brews to go along with the BJ's Brew lineup!